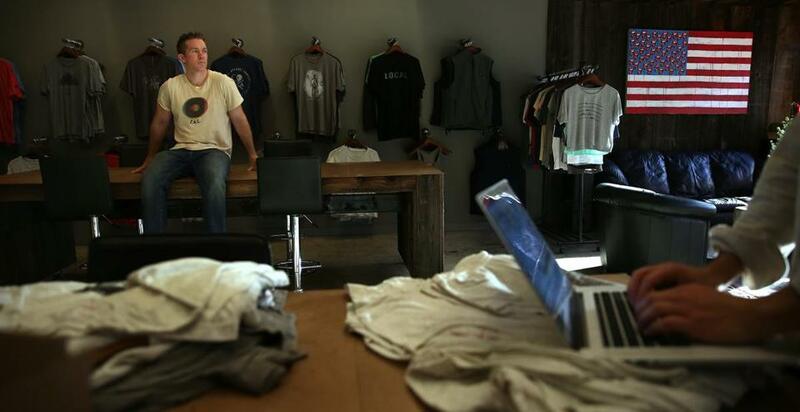 Casey Paton, owner of Encore Apparel Co., in the company’s retail showroom at the Charlestown Navy Yard. It was long past midnight on a recent Tuesday when I called it quits. I’d been shopping online for hours — looking at sizing charts, zooming in and out to inspect details on jewelry, and reading tasting notes of artisanal beers. I logged off without buying a thing. The Web offers plenty of convenience, but I’ve always considered shopping more of a contact sport. (And no, I’m not talking about the Black Friday charge and tackle.) I’d rather check out a dress’s fabric quality than click “go to checkout.” I’d rather crowd-source opinions in a dressing room than read disembodied user reviews. And when it comes to “locally made,” I want to be shown, not told. I want exactly what happened when I walked past the storefront of danger!awesome on Prospect Street in Cambridge. I noticed a shelf of wood-cut earrings ($15), laser-cut cards ($10), and latticed-patterned leather bracelets ($15). I went in to inspect laser-engraved wood rolling pins ($120-$200) and Escher-esque puzzles ($40). I must have looked baffled because a skinny-jeans-clad employee approached to explain things. That’s what I needed. Basically it’s a high-tech Kinkos. Bring in a photo and the technicians can burn the image into wood with lasers for customized wall decor. Or bring in an object — a pair of earrings, an antique toy — and they’ll create a resin facsimile using a 3-D printer. And if you ask, they’ll show you the industrial technology that turns out the finely detailed items. Custom-printing takes on a different dimension — one dimension, to be exact — at Heidi Pribell Interiors. Pribell, an antiques dealer turned interior designer, creates wallpaper ($110/yard) based on any image you can think of: landscapes, symbols, animals. Her Cambridge studio has a museum-like feel, what with the antique clocks and lamps scattered about and a carved marble mantel anchoring the space. She showed me how she riffs on designs to create vibrant images, from an impressionistic pattern from a single aerial photograph to elegant Victorian-style motifs. 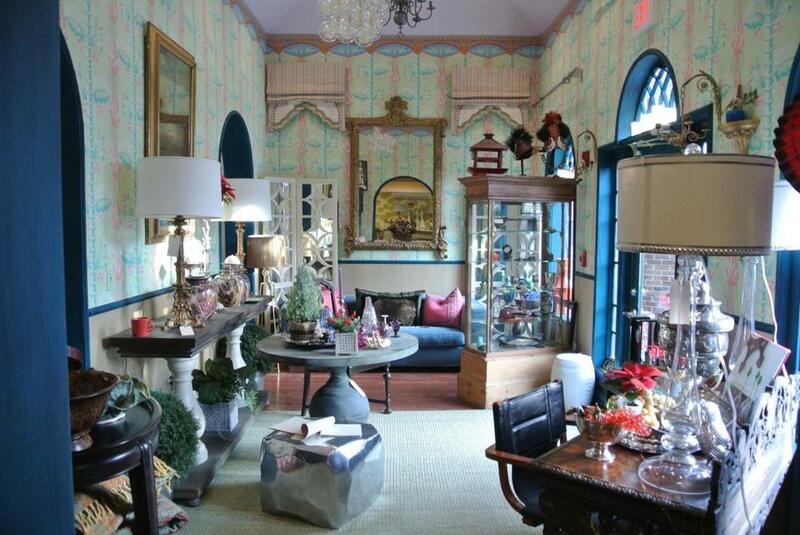 Heidi Pribell Interiors in Cambridge. In pursuit of local, I called Pam Santorelli, owner of the Southie boutique Habit, and the new Wears + Wares, an emporium of homegrown jewelry, accessories, and home goods. She sells by Encore Apparel, which Casey Paton, a Wall Street defector, launched last December. Headquartered in the Charlestown Navy Yard, it’s not easy to find, but worth the hunt. Set in a historic shipbuilding facility, it’s a hip, relaxed oasis: couches to kick back on and Paton’s vinyl collection to browse. The tees, exquisite cotton blends, feel like satin but have a well-worn look. Call it uptown-slacker-chic. The next day I headed to Boston Harbor Distillery in Dorchester. There’s been a huge craft spirits boom globally during the past few years and this distillery, Boston’s newest (there are two others just within city limits), is making some of the most interesting hooch in the area. And it’s all sold onsite. The facility pays homage to tenants who’ve occupied the space over the past century-plus. An informal tour ($10), I soon learned, is a crash course in the history of Boston’s entrepreneurs (SS Putnam Nail Factory, George Lawley & Son Shipbuilders, Seymour’s Ice Cream) as well as the whiskey-making process. The tour ended, of course, with samples of the various house-distilled whiskeys in a bar area. There’s the flagship Putnam New England Whiskey ($60), which delivers subtle milk chocolate flavors, and several limited edition expressions ($40) distilled from lesser-known Sam Adams beers, like the Merry Maker Gingerbread Stout, with its fresh ginger and espresso notes. I was also able to chat directly with the product maker at Violet Skin Boutique, a tranquil spa owned by Violet Mkhitaryan, an aesthetician, biochemist, and evangelist for natural skincare. Fragrant lavender-mint body scrub with Dead Sea salt ($42) and sumptuous peppermint hand cream ($27) are just a few of the beauty products that Violet formulates by hand at her workshop in West Roxbury. Liza Weisstuch can be reached at liza.weisstuch@gmail.com.